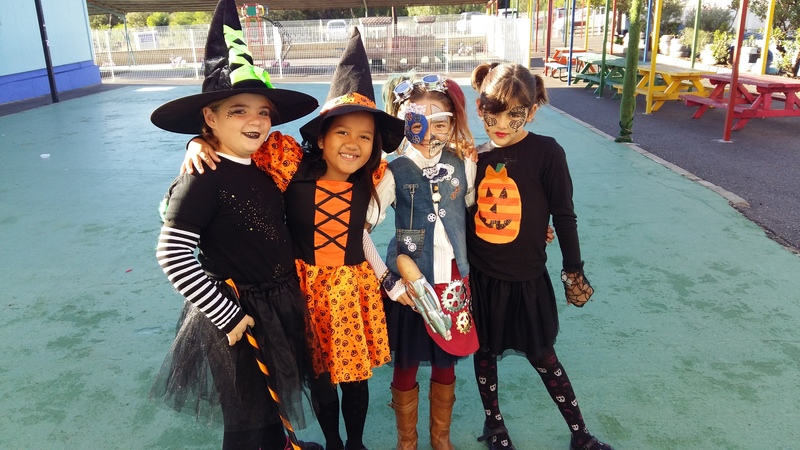 Last Wednesday, the staff, pupils and parents from the Sierra Bernia School In Alfaz del Pi, once again celebrated their annual Halloween Party. As ever, the school community had a great time at the spooky celebration, a party originating from Hallowe’en, also referred to as All Hallows’ Eve, a popular festivity most likely originating from European Harvest Festivals and festivals of the dead, celebrated by children and adults around the world. Although people originally dressed up to scare away any wandering spirits who might have taken a fancy to them; the children and staff had a great time channelling their “Inner Maleficent” and “boo-sting” their enjoyment by dressing up as ghastly ghosts, startling skeletons and wicked witches amongst others. Parents and children alike were invited to a “Trick or Treat with a Twist” some encountering slithery, slimy intestines as a prize, whilst others tested their skills and coordination by scooping “Ghosts into the Coffin” or passing the time by “Dead Man’s Finger Fishing”, whilst Miss Emma, “the Ghostest with the Mostest,” invited the children to test their awesome aim at the Ghastly Ghoul Balloon Bursting. If that were not spooky enough, the Secondary students prepared a “Terrifying Tunnel” through which only the bravest dared to pass! Luckily the smooth Motown tones of Melvin and the amazing upbeat Katy Perry live performers were enough to take even the most temerous minds off the terror within! The children spent all week preparing their fiesta, incorporating this long-standing tradition into all parts of the curriculum; terrifying tales, creepy crafts and magical maths, with absolutely Spooktacular results – bats off to them all!